So, have I mentioned I'm going away AGAIN this weekend? It's hard to believe that after all these years of minimal travel, I am spending 3 weekends away from my kids in one month! Every weekend away has been different, and this weekend is no exception. 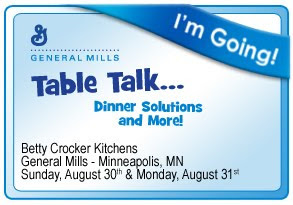 I'm headed to Minneapolis to check out the Betty Crocker kitchen! I understand we'll be eating & will even have the opportunity to cook in the kitchen! I can't wait to hear their ideas about family dinners, and to have the chance to spend time with a bunch of other bloggers. I'll bring my camera and computer, so come back Monday or Tuesday to read about my adventure. It's my first blogger event, and I can't wait!! Do you have any questions you'd like me to ask? I have a friend whose kids are gluten-free and she is excited about the new gluten-free mixes but hopes that they will make the mixes with a variety of flours. I'll ask about that - - and anything else you can think of! Leave a comment below!